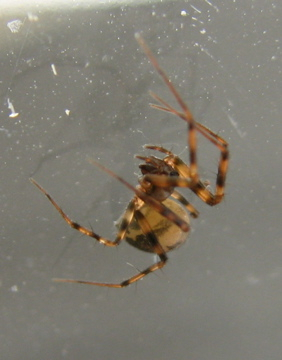 The specimen has eight legs, the body is 5 mm long and from tip of fore legs to tip of rere legs is 10 mm. The cephalothorax is black (and has five eyes, I think). The abdomen is yellow with ten black spots in two lines of five pairs along the back and a black line along the side. The legs are about 4 mm long, are hairy and are coloured yellow and black. The pedipalps hanging down in front of the cephalothorax show NO swollen tips, the chelicera are barely visible with a magnifying glass.